Discussion in 'Indian Defence Industry' started by Anees, Jun 7, 2013. Every single weapons is becoming â€œsmartâ€ now. first there were smart bombs,missiles and now a smart bullet. A team of engineers at Sandia National Laboratories, in Albuquerque, is **completing a testable prototype of the worldâ€™s first laser-guided **bullet. Like a â€œmini-meâ€ of smart bombs, this patented technology has some of the same computerized control and guidance features found on proven Gulf War weaponry, such as the Paveway series of laser-guided bombs. An infrared laser illuminates a target, which the bulletâ€™s optical sensors follow. An onboard tracking chip calculates the course corrections, carried out by four actuator-controlled fins on the bulletâ€™s body. 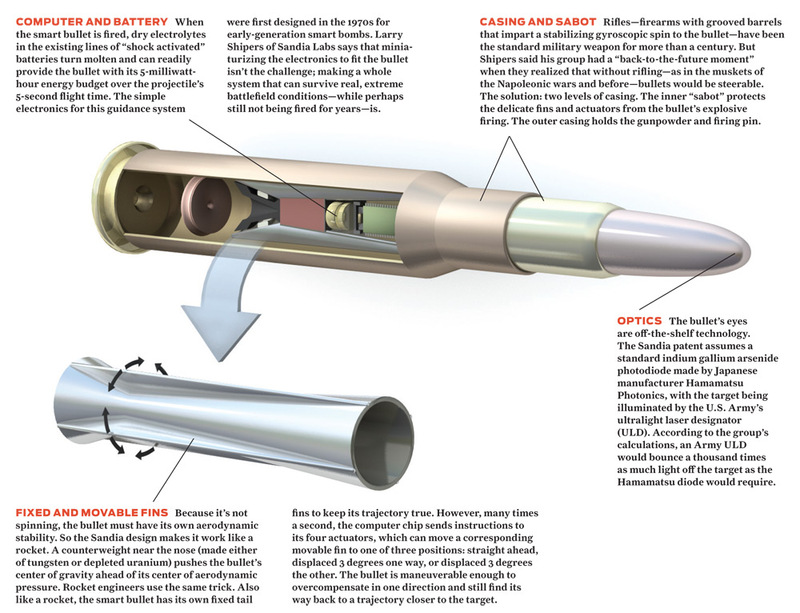 The bullet is a technological marvel as it has managed to overcome the difficulties of using a guiding technology in a small projectile which is tough to control as it gets affected by the wind and other peripherals much more than a large missile.Traditional bullets have grooves that make them spin when they leave the barrel to make it more accurate. Sandiaâ€™s bullet is different as it is designed not to spin so that its trajectory is easier to tweak during mid flight. The bullet flies straight due to its aerodynamically stable design, which consists of a center of gravity that sits forward in the projectile and tiny fins that enable it to fly without spin. how much does a single bullet cost ? Can be a true game changer in sniper warfare. It would not be a feasible tech. One Shot One Kill scenario cannot be used in war. Counter insurgency operations might have better use of it. So, how much this Guided bullet costs do you have any estimates?? Why not? Not to forget with increasing accuracy, the range also increases proportionately. Well it can be feasible only when you have a target lit up. If case of army 80% of the bullets doesn't hit the target, because they are not fired with precision on One shot one Kill like snipers. Most of the warfare which we will endure will one the mountain and harsh plateaus where little can be done to get the target lit up and fire with precision. It can be used on one scenario though, In cold-Start doctrine, it would help us to hold the pockets for longer time and score of kills will be lot efficient. That scenario is valid for normal infantry troops, not dedicated sniper. If the cost is our priority then these tech's will never get a go ahead to be used by our military. But a promising tech, needs to be evaluated. Well when we hold a strategically valuable place, we will need more precision and snipers would play a big part in that... i suppose that what i could guess from your reply.